The USS Enterprise was the Navy's first nuclear powered aircraft carrier and from 1961 to 1972 she was the biggest warship in the world. The world's first nuclear-powered aircraft carrier, USS Enterprise is the longest carrier in the Navy at 1,123 feet. It is also the tallest (250 feet) and fastest (30+ nautical miles per hour) carrier in the fleet. Originally built with a distinctive square island supporting phased-array radars and a complex EW system. Aviation facilities include four deck edge lifts, two forward and one each side abaft the island. There are four 295 foot C-13 Mod 1 catapults. Hangars cover 216,000 sq. ft with 25-ft deck head. The USS Enterprise carries 8,500 tons of aviation fuel (12 days flight operations). Built to a modified Forrestal class design, Enterprise was the world’s second nuclear-powered warship (the cruiser Long Beach (CGN-9) was completed a few months earlier). This new propulsive machinery would give the USS Enterprise a maximum speed of 35 knots and an estimated endurance of five years; by eliminating the need for oil storage and stacks it would provide twice the aviation fuel capacity of her largest predecessors and permit the installation, on the sides of the island structure, of fixed radar antennae of advanced design. When first completed the island of the Enterprise had a very unique shaped structure consisting of a dome shaped top resting on a box, supporting SPS-32 and 33 radars, plus many ECM antennas, which were located on all four sides and top dome of the ship. These were all removed during a 1982 retrofit, and the island was completely altered to resemble the island of Kitty Hawk class carriers. 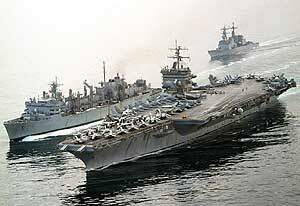 Enterprise is expected to remain in service until 2013 when it will be replaced by planned CVN-78. The Enterprise is anticipated to be 52 years old when it is retired.